Almost smack bang in the middle of the Australian continent lies the remote town of Alice Springs. Known affectionately also as “The Alice“, it is situated some 1,500 kms away from the nearest major city. That’s a long way by any measure but it you are touring the Red Centre of Australia, you will no doubt drop in here at some stage. As for me, I was only here for a short trip on a conference. But there are many who pass through here on their way to Ayers Rock or Uluru. For many visitors, this will be their first main encounter with the rich aboriginal culture. 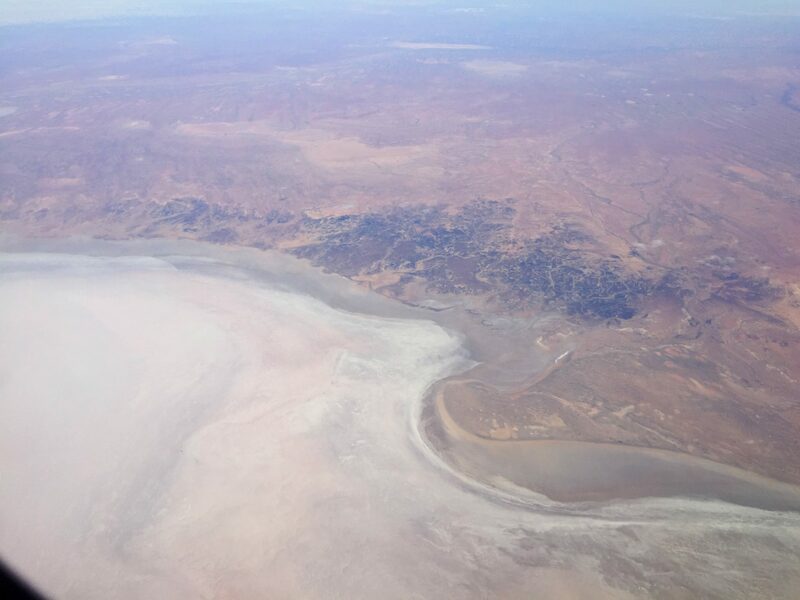 There are not many towns remaining in Australia where you will find more than five aboriginal languages being spoken. It is a beautiful rugged country. As, I was here at a conference, I did not really have a lot of free time. But I managed to squeeze in a couple of the local attractions. As we had a car, we headed out to walks not far from town. 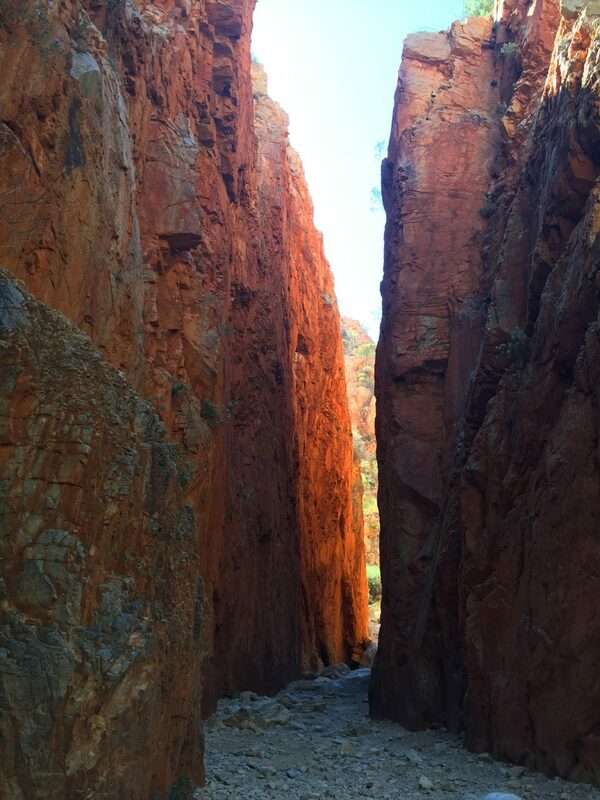 One of this was Standley’s Chasm along the Larapinta Trail which is about 50km away. It is called Angkerle by the Aborigines. But the name Standley actually pays tribute to Mrs Ida Standley who was the first school teacher here. (all the way back to 1914!) She was the matron of the school for children of Aboriginal descent and during her time, was the first non-Aboriginal woman to visit this feature. 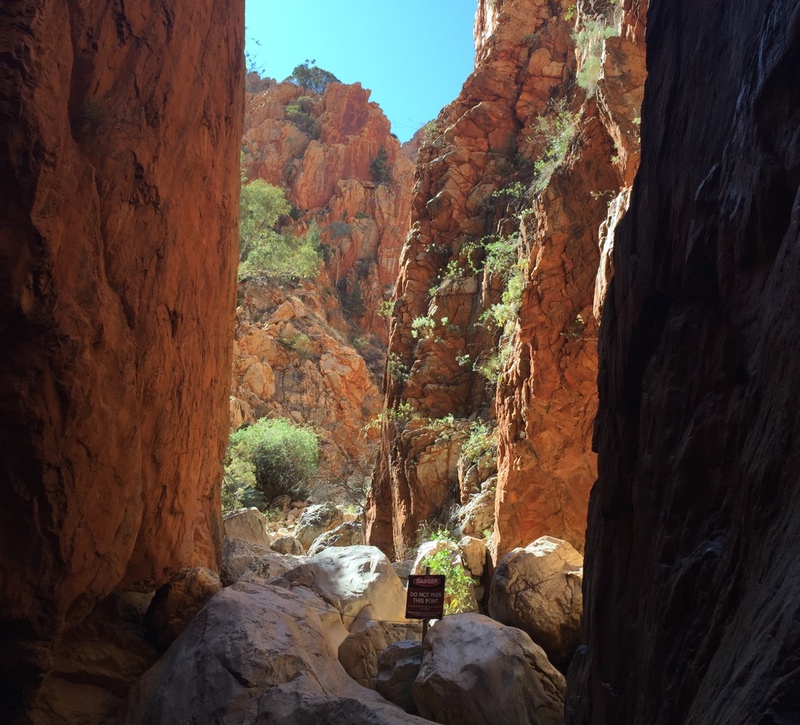 I took a panorama of the entrance to Standley’s chasm. 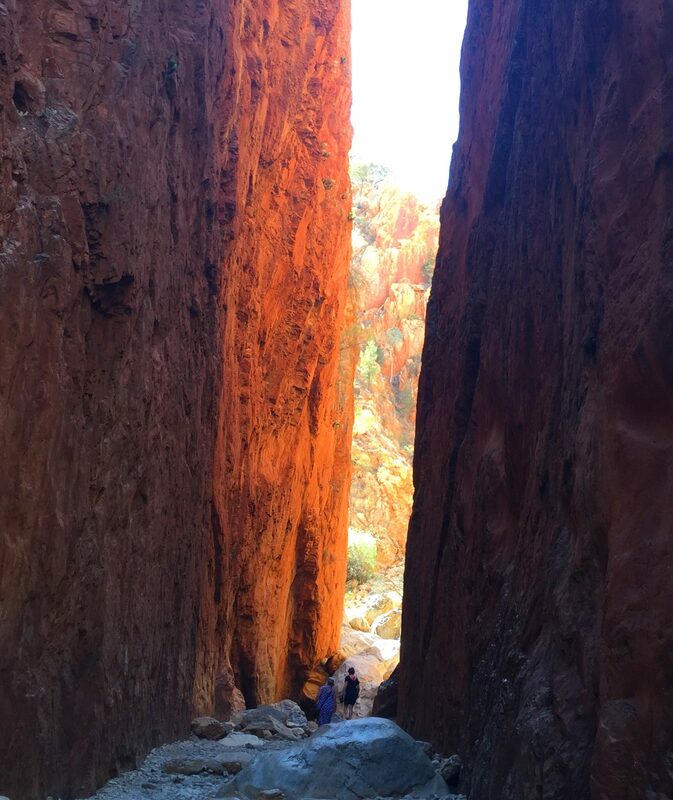 Hopefully this photo with my colleagues shows the sheer size of the chasm. The end of the chasm. You can’t go further once you come to the other side. Thanks! Wish I had been there at noon…..but lectures beckoned. I loved your mini-tour. What spectacular scenery! Thank you. I just wished I had more time. Cross I missed the famous Henley-on-Todd regatta! Its a boat race that is run on a dry sandy bed and quite funny.